Living in the tiny Portuguese village of Salir do Porto for two-plus years has taught me the important things that living in the U.S. made me forget. A visiting friend described it as, “living in a postcard”. Multicolored cliffs rise from the water of the only natural bay on the Iberian Peninsular. Ruins line the beach, the best pool art I have ever swam with. The Spring of Santa Ana flows from a pipe, the residents swear by it’s healing properties. Being so near Fatima, I can only guess some of the Virgin’s water is diverted to our little village just for us. Each morning the bread truck winds around the village, honking us out to buy our fresh bolinas and febras for an euro. Three times a week, Helder brings fresh fish to Salir from the fishermen of Peniche and always undercharges us for our salmon or sardinhas. We have a market, small but well supplied for most anything else we need. Four cafes, a bakery, a hairdresser, two restaurants and there you have the business community of the tiny village. We have learned to grow our veggies, although the “big city” Caldas da Rainha has the most wonderful fruit and vegetable market every day except Christmas. Once every couple of weeks we take our cloth shopping bags and hop the bus to do our large shopping. The fruit and veggie market, Lit’l (a great discount food market) and Pingo Doce our favorite supermercardo. Loaded up like burros we head home five hours later on the afternoon bus, all set to burrow into village life uninterrupted. Time moves slower here, with only three buses a day to the nearest medium sized cities with proper shops (and no buses on weekends) there is plenty of time to see the sunset to it’s final plunge into the Atlantic Ocean. I learn from the church bells if there has been a death among us, the bells ring three times, three times after the noon chimes. Soon, from my terraco, I will see a gathering in black at the walled cemetery of elaborate crypts. 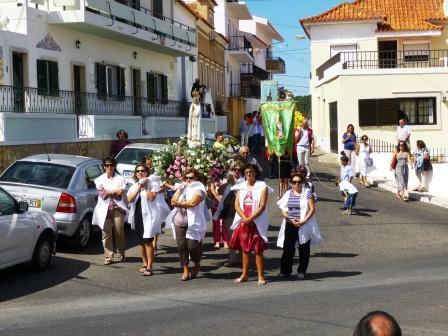 The bells ring often as the elders fade with not many of Portuguese youth wanting to live a quiet village life. As the sons and daughters leave the village for work in Lisbon, England, the U.S. and beyond, more and more of the family homes stand empty, waiting for their return back for a month in the summer. Or, for the inevitable Vende, or For Sale sign. After TIVO, DVDs, Big Screen TVs, Swimming Pool, Hot Tub, a big car. Being bombarded by advertising telling me I need more, selling nearly everything I own to now living on the other edge of the Atlantic watching my broccoli grow from a tiny seed to a beautiful little green tree on the end of my fork. I appreciate the world more. The sky is clearer and the stars can be counted, most nights one flies across the night sky for me to wish on. Leaving your home country is daunting, after almost three years in tiny Salir, I have learned you can’t put a price on peace. This entry was posted in Ex-Pats Abroad, hiking, Portugal Silver Coast, Portugal Village Life, salir do porto, Travel. Bookmark the permalink. You do lead an idyllic life in a beautiful village nestled between the bay and the ocean. I enjoyed my time there so much. Short of the no clothes dryer, it could be paradise, indeed! You should have chosen to move North instead South, the North is way more beautiful, the people are nicer, the weather bearable in the summer and the food is way better. Thank you. I adored my peaceful Salir do Porto, I never felt like an “estrarango”, but another eccentric long lost cousin. Since Jan. 2013, almost a year now we have call Lagos home. A big adjustment from friendly village life, but how I love the sea and my imagination takes me far away from the tourist trappings. Daily passing where the Age of Discovery found no end to the world of adventure.